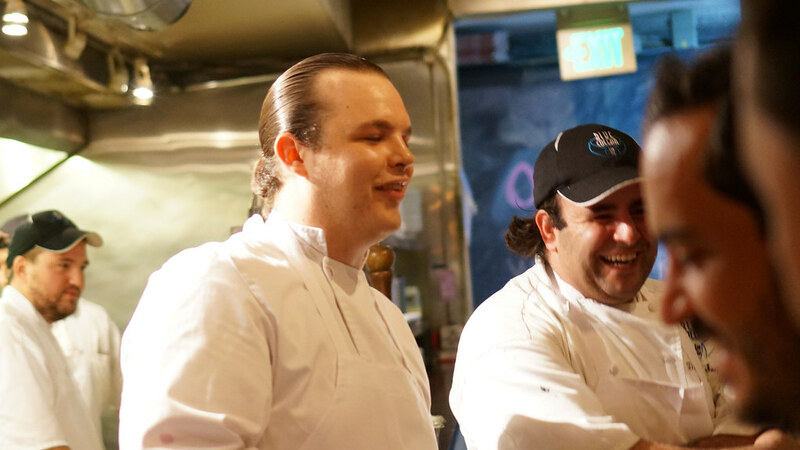 That's just an example of the good-natured ribbing going on between chefs Danny Serfer and Brad Kilgore in the week leading up to their "Odd Couple" dinner at Serfer's Blue Collar restaurant. Why "Odd Couple"? 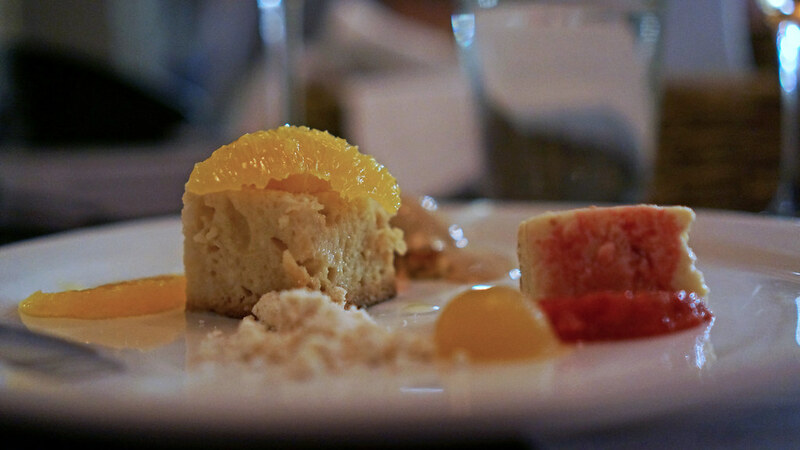 Well, Kilgore is the culinary Felix Unger: before coming to Miami he worked at high-end Chicago places with a constellation of Michelin stars: Alinea, L20, Boka and Epic. When he was sous chef at Miami's Azul, Andrew Zimmern dubbed him "Wall Street" for his slick style and slicked-back hair. Yes, there are probably tweezers in his knife bag. That would make Serfer the culinary Oscar Madison. 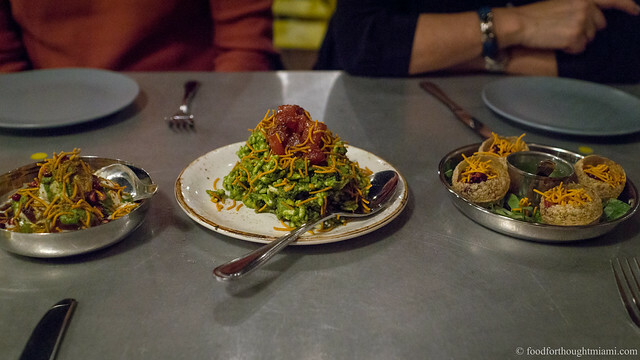 His style is exactly as the name of his restaurant, tucked into the still-slightly-dodgy Biscayne Inn on Biscayne Boulevard, suggests: it's upscale diner food, straightforward, hearty, and if it's a little sloppy, well who cares? It'll still taste good. Truth is, Serfer's done the fine dining thing too, with several years at the now-closed Chef Allen's before opening his own place. Now he's cooking the food he wants to cook, and that people want to eat, as the popularity of Blue Collar will attest. So when Brad and Danny decided to do a dinner together - possibly with some prodding from The Chowfather (who also "curated" some liquid refreshments) - "The Odd Couple" was a natural spin on it. Each chef ended up doing their own take on five different proteins, with desserts contributed by pastry chef Soroya Caraccioli (a/k/a Soroya Kilgore, who happens to be Brad's wife). 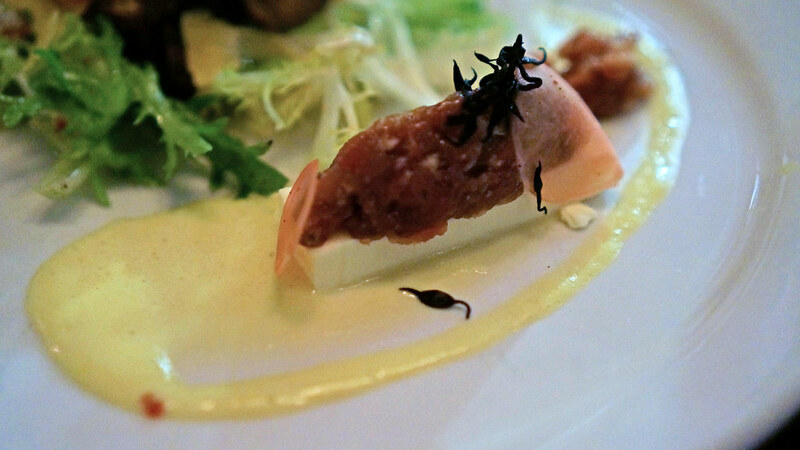 It was a really fun meal where each chef stayed faithful to his style. (You can see all my pictures in this Odd Couple Dinner flickr set). Right out the gate, both chefs were resorting to secret weapons. For Danny, it was a mini Portuguese muffin, something I've previously described as "the love child of an English muffin and brioche." It's the standard vehicle at Blue Collar for his great burger and the off-menu "Corben" sandwich. Here, it was the base for a "po'boy" of pulled stone crab meat, a smoked trout roe tartare sauce, all dressed with lettuce, tomato and onion. I didn't get a good picture, but I did get a good taste, and this was a great little sandwich. Brad, meanwhile, went immediately to the nuclear option: bacon. 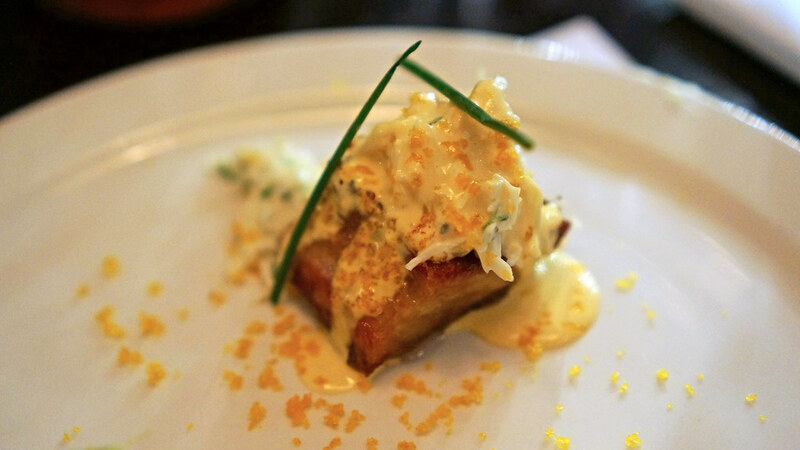 A slab of cured and braised pork belly was the base for a mound of stone crab dressed in an uni-ricotta emulsion, topped with shavings of bottarga and snipped chives. I'm a sucker for pork and seafood combinations, and for uni, and for bottarga, and this was delicious, but I think Danny's po'boy did more to highlight the taste of the stone crab itself. 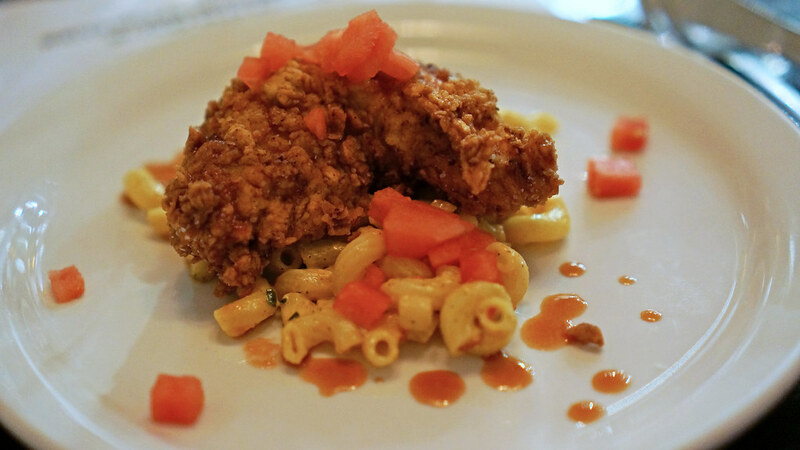 For the rabbit round, Danny went with a "Chicken Fried Thumper," paired with macaroni salad and watermelon gastrique. It seems whenever anyone describes a "different" protein - rabbit, frog legs, alligator especially - they say it "tastes like chicken." This rabbit? It, in fact, really did taste like chicken. This was all the flavors of a summer picnic on one plate. Brad may have only gotten the carcasses but he made good use of them. 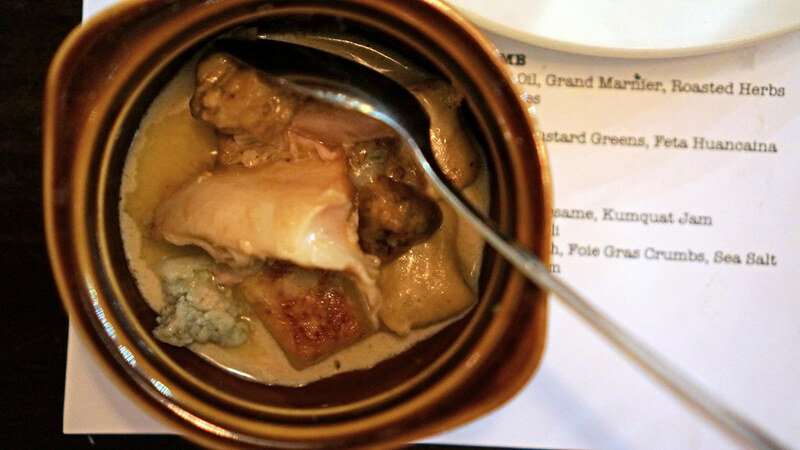 The meat from those carcasses was smoked with cinnamon, and paired with gingerbread-flavored gnocchi and porcini mushrooms in a creamy sauce. Great woodsy, winter-y flavors here - one of my favorite dishes of the night. I had a seat at the bar counter for the evening with a direct view into Blue Collar's open kitchen, and was impressed at the crew's ability to turn out 25 plates at once from that tight galley. 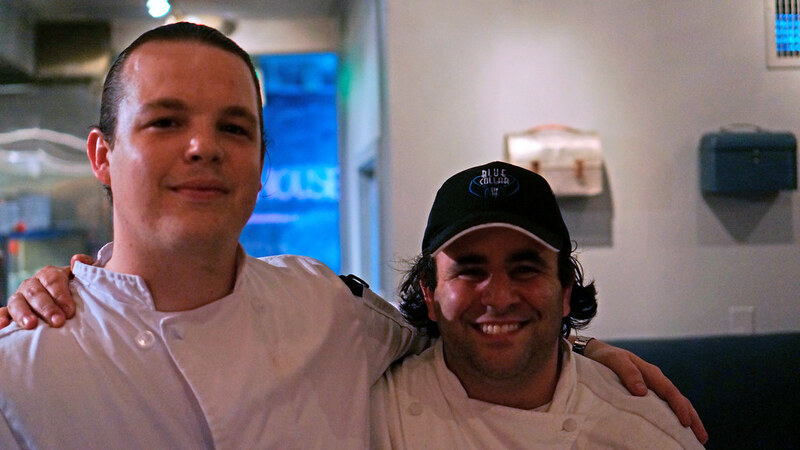 Brad and Danny plated a couple courses together, giving the chance for a real head-to-head comparison. Danny used royal red shrimp, a fantastic but rarely seen local product, for a scampi style dish with garlic, crushed red pepper and lemon over grilled bread. 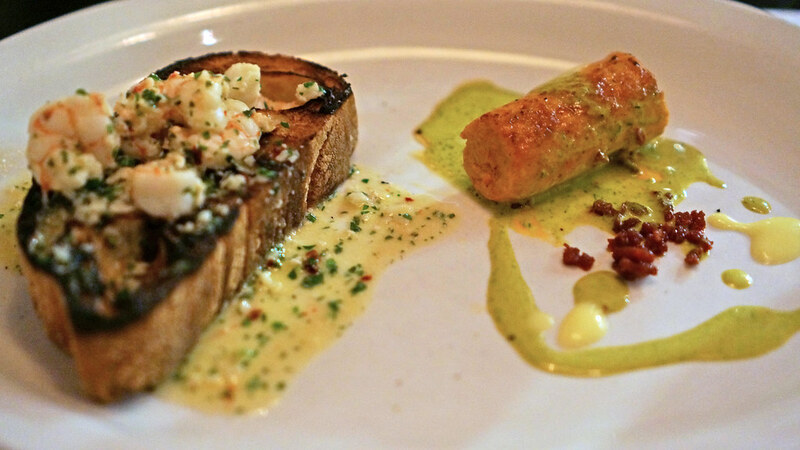 Brad's dish was as new-school as Danny's was old-school: a "chorizo" sausage molded from shrimp, draped with Meyer lemon and dill emulsions. Brad gets points for creativity, with his sausage faithfully recreating the pimenton-spiked flavor of chorizo in a seafood format, but those royal reds, still soft and tender and sweet, carried this one for Danny. Another side-by-side plating, with Danny again going traditional with a frisée lardon salad using duck lardons and a duck fat vinaigrette, along with shavings of Beemster cheese and a fried quail egg, and Brad going modern, with a cured duck tartare served over a Kewpie mayo gelée and a rich, faintly sweetened duck egg yolk sabayon. 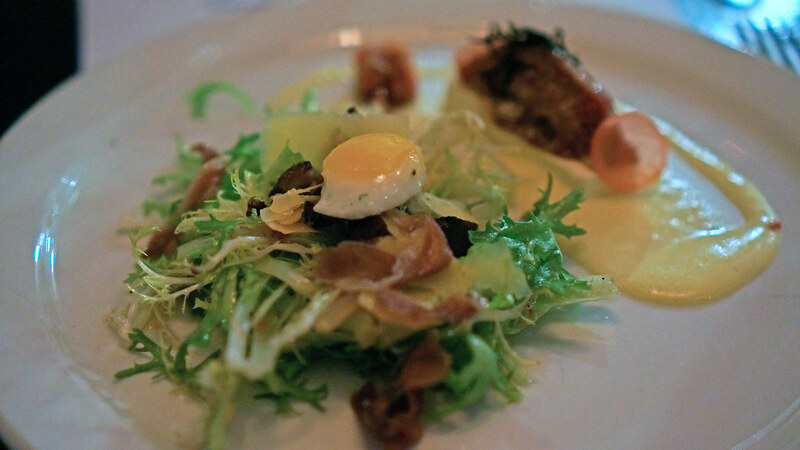 I loved the duck lardons in the salad; I loved the duck tartare on Brad's dish. And I found the salad a tad underdressed, and the sabayon a tad too rich. So what did I do? Put them together. Perfect. Maybe these two were meant to be together. Going into the final savory round, Danny was up one. But Brad came back strong with his lamb. 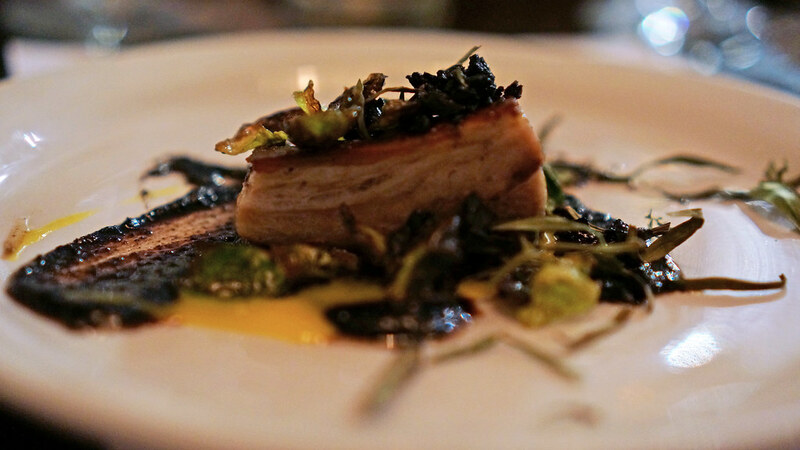 The belly was marinated in yogurt for two days, then braised in yogurt, and plated with olive "fruit oil," a thick sauce with oil-cured black olives as the base, a drizzle of a Grand Marnier sauce, and charred brussels sprout and tarragon leaves for contrast. This for me was the standout dish of the night: the rich, faint gaminess of the lamb both enhanced and tempered by the Mediterranean inspired accompaniments. In response, Danny went for a knock-out punch. 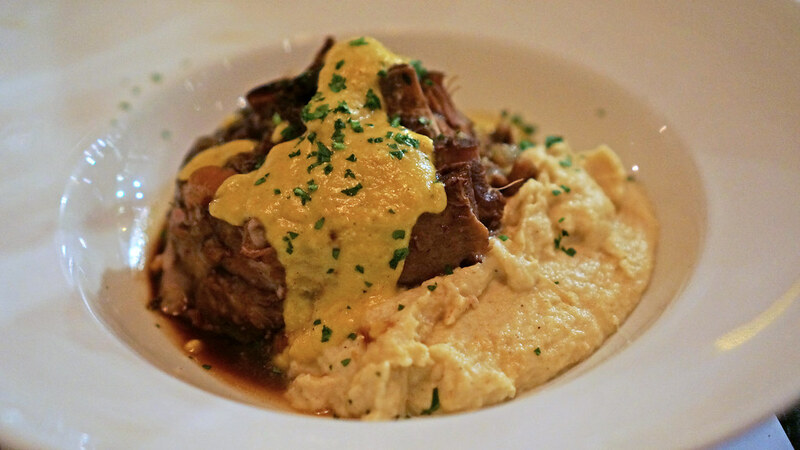 There's always something braised on the menu at Blue Collar: the "Big Ragout" includes pork and veal shoulder along with brisket, stuffed in a hollowed out roll or served over pasta, and then you'll often find oxtails, pork cheek, or some other cut cooked low and slow. For the "Odd Couple" dinner, Danny went with lamb necks, braised in red wine and served over a parsnip purée, topped with a rich, faintly spicy feta huancaina sauce. The lamb necks were cross-cut and appeared almost like an osso buco, and had the same nearly silky texture. This was a hearty, satisfying dish (and the massive portion made sure nobody was going home hungry), but it was up against tough competition. Soroya closed out the evening with a couple of very nice desserts: first, a cayenne-spiked chocolate "lollie" dusted with toasted sesame seeds and crowned with a kumquat jam; and finally, a citrus-soaked cake paired with macerated blood orange and other citrus segments, a foie gras "crumble," and a rich salted caramel ice cream. If Brad gets credit for marrying well, then Soroya's contributions would carry the day, but that would be an unfair advantage. So instead, Danny and Brad will have to settle for a draw. I think they'll be OK with that. This was a lot of fun and a great chance to enjoy one great meal with two completely different cooking schools. I think what I most enjoyed about it is that both Danny and Brad stayed true to their individual styles. 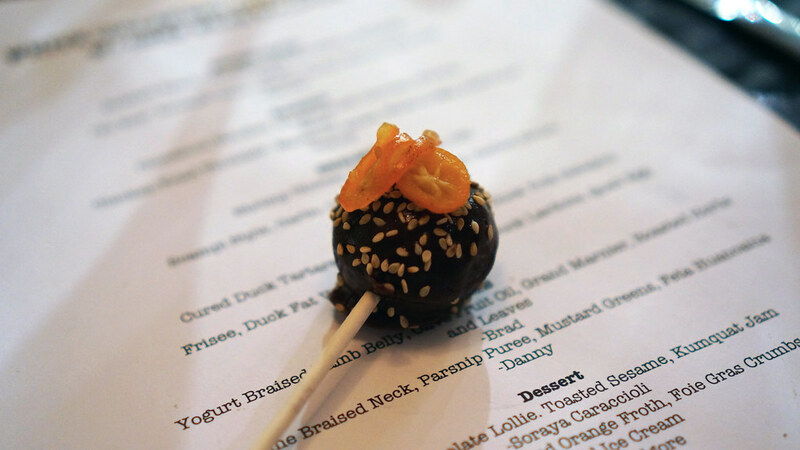 Danny has a real knack for hearty, satisfying, deeply flavored food, which he delivered with every course. And Brad, as I've said before, is a genuinely exciting young talent, who is going to really shine when he finds the right opportunity.